Crime Stoppers and the Sudbury OPP are seeking the public’s assistance in identifying suspects in relation to a break and enter. Sometime between April 9th and April 10th, culprits attended a property situated on Highway 64 in the Municipality of French River and broke into a residence. Stolen from the residence was a quantity of money, cigarettes and cigars. Crime Stoppers and the Greater Sudbury Police Service are seeking the public’s assistance in identifying suspect(s) in relation to a theft. Sometime between March 31st and April 1st, culprit(s) attended a commercial establishment located on Lasalle Blvd near Auger St and stole a dump trailer. The trailer had been parked at the back of the property and filled with waste that was covered with a tarp. The trailer is described as a black metal dump trailer by JDJ Brand, with dual wheels. The trailer has walls about 2 feet high and had a construction sticker on the front side wall, and a storage box on the front tongue area. Crime Stoppers and the Espanola OPP are seeking the public’s assistance in identifying suspects in relation to a break and enter. Between March 11th and March 12th, culprits attended a business situated on Second Avenue in Espanola and broke into a building. Stolen from the property was a floor safe and a quantity of money. The Greater Sudbury Police Service and Crime Stoppers are seeking the public’s assistance in identifying a suspect with relation to a theft. Sometime in the early hours of September 11th a vehicle was stolen and later recovered in an area of behind a store in Val Caron. Taken from within the vehicle was a digital camera kit which included all the photos from a wedding held on September 10th. The camera is described as a Canon 5D Mark 2 SLR digital and did have 3 additional lenses with it. All of the new bride’s photos were on the memory card in this camera. An image of a male party attempting to use a stolen credit card associated to the vehicle has been obtained. Any information in regard to the person of interest would be greatly appreciated. Just before 6:30 p.m. on November 1, 2018, Police were called to a residential unit at 775 Cambrian Heights in relation to an unconscious woman. Greater Sudbury Fire Services and Paramedic Services had attended the residence after an ambulance was requested by a family member. Upon arrival Firefighters found the condition of the woman and the appearance of the apartment to be suspicious. Officers arrived a short time later and began to investigate. The woman was transported to hospital by Paramedics. It was determined that valuables belonging to the woman were missing including her purse, jewelry and prescription medication. Through the investigation it is believed that an unknown individual disguised his/her face and gained entrance to the woman’s unit sometime between 8:00 p.m. on Wednesday, October 31, 2018 and 4:00 a.m. on Thursday, November 1, 2018. Once inside the residence, the person threatened the woman leaving the residence with the various items. The elderly woman remains in hospital in serious but stable condition after going into medical distress as a result of the incident. Anyone with information related to this incident is asked to contact the Criminal Investigations Division by calling 705-675-9171 in relation to incident number 75633 or by calling Crime Stoppers at 705-222-8477 to remain anonymous. East Algoma OPP Blind River Detachment is asking for the public's assistance in solving several thefts of fuel in the Mississagi Bay Road area. Members from the East Algoma Ontario Provincial Police (OPP) detachment are investigating several thefts of diesel fuel on the Mississagi Bay Road area in the Municipality of Huron Shores. On July 23, 2018, shortly before 9:00 a.m., police attended a logging area on Mississagi Bay Road (off of Dean Lake Road) where over 200 litres of fuel was stolen from a portable fuel tank situated at the logging landing. Investigation determined on or about June 24, 2018, a theft of fuel at another logging site along Highway 17, west of Eastman Road near the Town of Blind River, an estimate of 300 litres of fuel was stolen from an excavator that the same logger owns. On July 26, 2018, another report of theft of fuel was stolen from a portable fuel tank at same Mississagi Bay Road logging site. The estimated value of the fuel is over $800. Any person with information regarding the person(s) responsible for these thefts should immediately contact the Ontario Provincial Police at 1-888-310-1122 or their nearest police authority. Should you wish to remain anonymous, you may call Crime Stoppers at 705-222-TIPS (8477) or long distance at 1-800-222-8477 or submit information online at www.tipsubmit.com where you may be eligible to receive a cash reward of up to $2000. Police are requesting any information from the public in relation to a mischief in Iron Bridge. On July 20, 2018, shortly after 10:00 a.m., members from the East Algoma Ontario Provincial Police (OPP) responded to a mischief at a property at 22189 Highway 17 (the old McCoy’s Motel) in the Village of Iron Bridge. Investigation determined the mischief occurred between July 18, 2018 and the evening of July 19, 2018. At the property there were several vacant buildings that were observed to have spray-paint tags in pink paint and an empty can of orange paint that was left behind. The estimated damage is $500. Any person with information regarding the person(s) responsible for this mischief should immediately contact the Ontario Provincial Police at 1-888-310-1122 or their nearest police authority. The Greater Sudbury Police Service and Crime Stoppers are seeking the public’s assistance in identifying a suspect with relation to theft. On June 28, July 4th and July 22nd a male party attended a gas station located in Val Caron. He proceeded to fuel his silver 4 door Nissan Versa Hatchback and leave the station without payment. In each incident the plates have intentionally been covered. The value of the stolen fuel has been in excess of $ 150. Any person with information regarding the person(s) responsible for this incident should immediately contact the Ontario Provincial Police at 1-888-310-1122 or their nearest police authority. 911 can be used if it is an emergency. Should you wish to remain anonymous, you may call Crime Stoppers at 705-222-TIPS (8477) or long distance at 1-800-222-8477 or submit information online atwww.sudburycrimestoppers.com where you may be eligible to receive a cash reward of up to $2000. Crime Stoppers and the East Algoma OPP are seeking the public’s assistance in identifying suspects in relation to a theft. On Saturday, June 30th, 2018, police responded to a theft from a motor vehicle at Lake Lauzon Beach in Algoma Mills, Ontario. 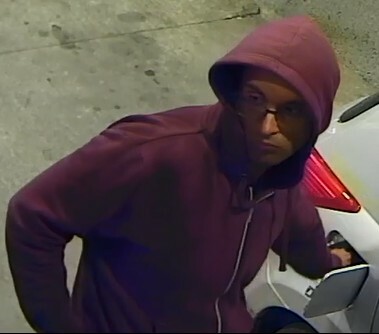 Suspect(s) smashed the front passenger side window and stole a gas can, iPhone 8, and a purse which contained identification, debit cards, credit cards and $150 cash. The stolen credit cards were used by the suspects the same day, June 30th, 2018, at several Elliot Lake, Ontario establishments. The male suspect is described to be in his mid-40s, with several tattoos on both arms, right side of his neck and on both calf muscle areas. The female suspect appears to be in her mid-40s, with a tattoo on her left inner arm. 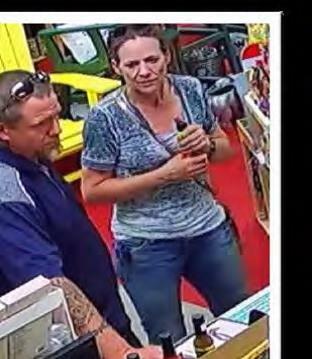 Crime Stoppers and the West Parry Sound OPP are seeking the public’s assistance in identifying suspects in relation to a theft. 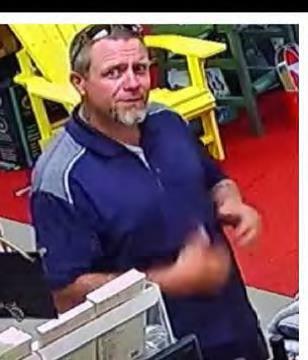 Sometime between 5:30 pm on June 28th and 8:00 am on July 3rd, suspect(s) gained entry onto a property situated at the Henvey Inlet Wind Turbine Farm Project off of Highway 69 and stole numerous items. 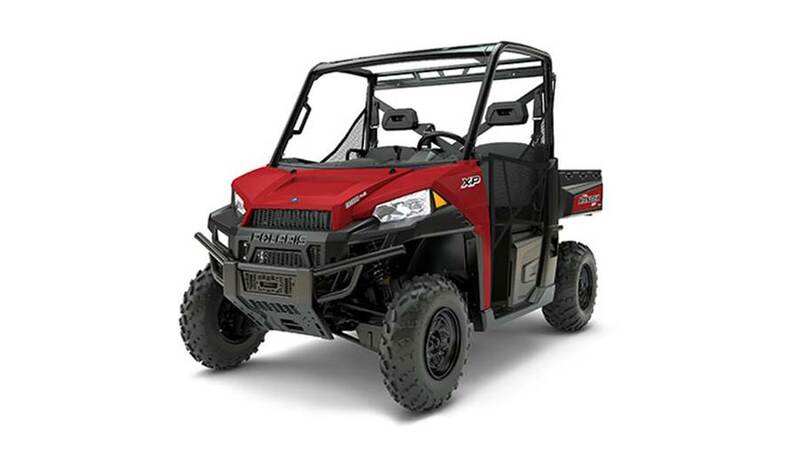 Suspects stole a red 2018 Polaris Ranger XP side by side UTV along with two fire suppression packs, a shovel, ratchet straps and two helmets. The value of stolen property is estimated to be approximately $25,000.